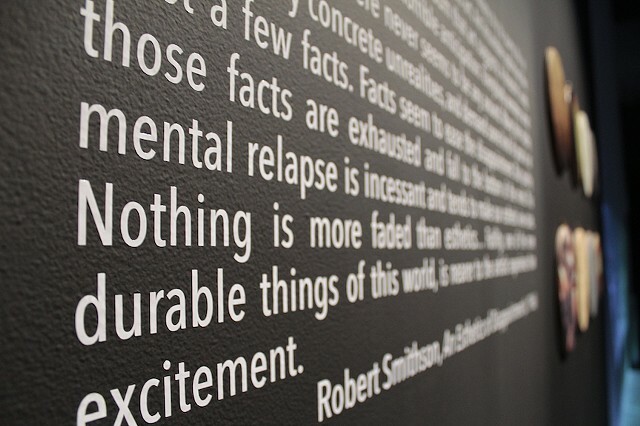 Site-specific vinyl adhesive lettering, text excerpt from An Esthetics of Disappointment (c. 1966) in Robert Smithson: The Collected Writings (Jack Flam, ed.). 1996: University of California Press. *presented for this exhibition exclusively, with permission from VAGA on behalf of the Holt-Smithson Foundation. This short essay was written, “On the occasion of the art and technology show at the Armory.” In the full text, Smithson deplores that, “…everything electrical and mechanical was buried under various esthetic mutations. The energy of technology was smothered and dimmed.” The excerpt I chose to include in Biomateria is placed in a new context, but one that resonates with Smithson’s original disdain: that of the disappointment of viewing biotechnological works presented within a visual art/ gallery format. This format somewhat negates the temporal aspect of the works (in the static environment of the gallery), the vital or ‘living’ aspect of the works, in addition to the interactivity of the process-based nature of maintaining the work. The spectacle of science, amplified by pop culture media (the Internet), falls flat on its face in presenting microscopic live works as themselves, as works of art. Audience disappointment, where art world monumentalism is expected, may be palpable as everyone thinks to himself or herself, “Is that it?” In such a case, the apparatus in which the work is presented becomes critical to the content of the work, where microorganisms cannot truly be seen, heard, felt nor sensed in any tangible way. Additionally, inclusion of this text is a nod to Smithson, a well-known land artist, working in a genre that arguably presents some of the first ‘BioArt’, its actions of human intervention in biological living systems and the ethical (environmental) considerations that arose from those actions.